Eating healthy does not always mean feeding on the same old-fashioned salad and boiled vegetables. In fact, I recently discovered a new card on the diet table - Wild Rice! For those who have never seen it, purple rice is one of the several varieties of colored rice. Anthocyanins are the color pigments that give many foods their deep rich red, blue, and purple colors. The risk of several chronic health conditions, including atherosclerosis, is also lowered by regular consumption of such foods. They have a slightly nutty flavor that might need some getting used-to, but their distinct color and nutritive content far outweigh this fact, making them a great addition to salad recipes. I added some cooked garbanzo beans, and some onions, walnuts and tomatoes to make this delicious Wild Rice Salad which could very well be served as a side dish. Heat half of the olive oil in a small skillet on medium high heat. Add the chopped onions and saute till mildly soft and brown in color. Next add the garbanzo beans and add about 2 tbsp water. Then add the cooked wild rice, salt, pepper and green chillies and let it cook for about 5-7 mins. Once done, let the rice cool to room temperature. Whisk together the remaining olive oil and red wine vinegar to make the dressing. In a large bowl, gently mix together the cooled cooked rice, green onions, chopped tomatoes, walnuts and the dressing. Garnish with some chopped cilantro, and serve the Wild Rice salad as a healthy and delicious side dish! That's a awesome nutrition packed salad Mansi. Healthy and delicious. nice to see you getting back :) hope the baby is doing good! Wowie...this is a great salad...filled with nutrition...i loved it..
Nice to see you back. Hope the little one is doing fine. This salad is less a salad and more a perfect one dish meal, I think. What a tasty looking wild rice & chockpea salad!! I love the addtion of the onions, walnuts & tomatoes! With the green chilis, it gives this healthy salad a little kick! I kinda like the crunchy taste of wild rice and it looks colorful when I make a risotto with it along with arborio rice, tarragon, coconut milk all cooked in white wine. Thanks for the post. Thats it - it all looks so good. I gotta eat then workout. Sure a healthy salad, looks nutritious! Hey, Nice blog post. I was struck in your blog especially the first line "Eating healthy does not always mean feeding on the same old-fashioned salad and boiled vegetables." Because I always do that and end up feeling like punishing my taste buds because it is not satisfied. Great recipe...I've never taste wild rice so I was surprised with great taste..Other ingredients was great also. What a great and nutritious salad! It seems the two go hand and hand. Lovely! 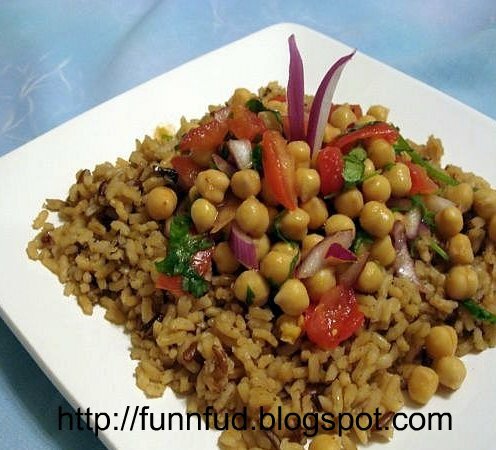 I love garbanzo beans added to a salad and with wild rice this is a winner!